By default, eClass is configured to allow instructors of credit sections to enroll any TAs or additional instructors to their course. To do so, follow the instructions in the article Adding additional users to my eClass course. 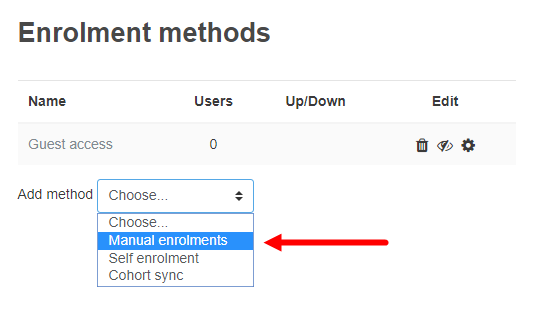 If you are missing the Enroll users button, you may need to re-enable Manual enrollments in your eClass course. This should generally not be required as the method should be enabled by default in all courses. You should only need to do this if your manual mehtod has been inadvertently deleted. 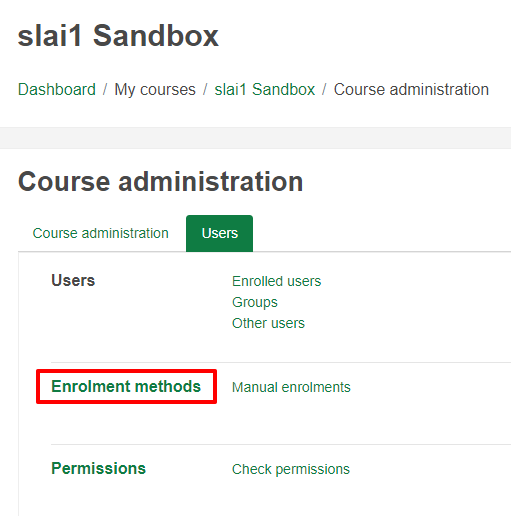 Go to your Course Administration options and click the Enrollment Methods link from the Users tab. From the 'Add Method' dropdown menu at the bottom of the list, select Manual Enrollments. In the Manual enrollments screen, leave all the options as they are, and click Add Method. Now you are able to manually add participants to your course in the Enrolled Users Setting.